Faye Rapoport DesPres’ fiction, creative nonfiction, reviews, interviews, and poetry have appeared in a variety of literary journals and magazines, including Ascent, BOXY Magazine, Connotation Press: An Online Artifact, Eleven Eleven, Fourth Genre, Into the Arts, Superstition Review, and the Writer’s Chronicle. Faye earned her MFA at the Solstice Creative Writing Program at Pine Manor College. Her first book, a personal essay collection/memoir titled Message From a Blue Jay, was published by the independent press Buddhapuss Ink in 2014. 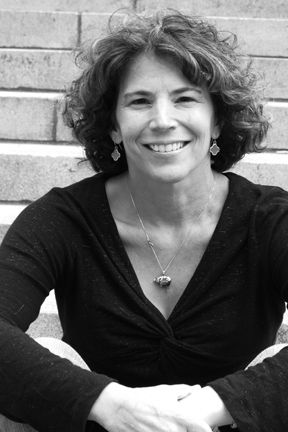 Faye lives in the Boston area with her husband Jean-Paul, and she teaches creative writing at Lasell College. "Varmint” is a mesmerizing, touching story that had me crying at the end. You usually write essays, but this beautiful fiction story is a winner! How did you decide on the structure for this one and why fiction? I’ve been playing with fiction for a while. I focused on creative nonfiction during my MFA program, and was writing personal essays almost exclusively for five years. But I’ve always felt the call of fiction, too, and I started working on some short fiction pieces a few years ago. I was then asked to teach a literature course on short stories at Lasell College, and the reading and teaching I did for that course deepened my interest and respect for short stories. “The Varmint” came from something a former neighbor said to me. The character “Paddy” in the story is based on this neighbor, and “Alice” is based on his wife, but the details of the characters’ lives in the story and the events that take place are total fiction. One day I was talking about a groundhog we had in our yard to the “real” Paddy, and he said that he’d had a “varmint” in his yard the year before. That comment always stuck with me, and it became the seed for this story. In terms of structure, I was trying to write something that had a lighter touch than some of my creative nonfiction, and that’s where the repeated “…than you think” lines came from. This is a streamline progression that brings us to the love story that it comes to be. Did you know the end before you began writing it? I had a strong idea of where I wanted this story to go, but I wasn’t sure how it would come about or what the ending would look like. That came with the writing. Are you planning on putting together a collection of fiction? This question made me smile. I’ve thought about it. I’ve published several short fiction stories now, and of course it makes me think…yes, maybe I’d like to put together a collection. My first book is a “memoir-in-essays” that is pretty much a collection of personal essays. So…yes, this is on my mind! I have a novel that I’ve been working on…lately mostly in my mind. I wrote about half of it a year ago, and then life interfered. The novel wasn’t feeling quite right, so I let it go for a while. I’ve had a lot of ideas lately about where I might want that novel to go, and it might require a total re-write. Sometimes you have to put a piece away that isn’t quite working until you figure out what to do with it. So, that’s one thing I’m working on in my mind right now. I also want to write more short stories, and every now and then I get the impulse to get back to creative nonfiction. With all the insanity going on around us, how to you keep your calm? I know you are runner/walker extraordinaire because we both have fitbits and I saw your totals each day! How do you find to do that, as well, each day? Oh, that is so funny! I’ve been an athlete of sorts for most of my life. I am not sure if the fitbit is a blessing or a curse, because ever since my husband gave me one as a gift I feel obligated to get in those steps every day. I have a part-time job, and I walk a mile to and from that job, so that helps. I also take Zumba classes because I love to dance and I love Latin American music, and sometimes I go running, and sometimes I just march around the house driving my husband and our cats crazy. Haha! I do the same thing! That FitBit is a bit of a curse! Do you write every day? Do you have a specific writing routine that you follow? For a long time, I woke up early and wrote for an hour or more before I got my day started. I’ve had a hard time sticking to that schedule for the past four or five months, because I’ve been working part-time, freelancing at home, and teaching creative writing. The combination has been exhausting, and my writing has suffered. That’s why a lot of the work on the novel has been happening in my mind. I still wake up early and try to write, but often I end up journaling instead of writing something creative. I expect that to change after the semester ends, because I am taking next semester off from teaching. It’s hard to make these decisions. I want to do it all, but I can’t. I read a quote recently that said something like, “Write until not writing makes you anxious.” That’s the state I’m in now. I feel anxious because I’m not writing enough. So, I have to pay attention to that anxiety. What is your favorite varmint? I love every animal out there, from groundhogs to skunks to cats to horses to turtles to spiders to every bird in the sky. I love them all. I don’t mean that in a superficial way. I mean I really, truly, deep-in-my-gut, love them. To me, they are love. They are beauty. They are innocence. They are love. You are one of my favorite human animals. When I met you I already knew I was going to love you! I see how many strays you take in and all the birds you feed. Truly a love story like “Varmint”. What is some other work that you do. Do you mean professionally? I’ve done most jobs that writers do to pay the bills. I’ve written for newspapers, marketing agencies, PR agencies, and businesses. Right now, I’m a freelance writer, editor, and proofreader working out of my home office. I also have a part-time office job to help pay the bills, and I teach creative writing and literature courses as an adjunct professor at Lasell College. I also enjoy photography, and I have my first photo exhibition currently up in Harvard Square in Cambridge, MA. The photos are of birds. I’ve had a lot of influences. In creative nonfiction, I was especially influenced by my instructors at the Solstice MFA Program at Pine Manor College: Joy Castro, Michael Steinberg, and Randall Kenan. I had a lot to learn when I started that program, and I gained so much, when it comes to craft, through my work there. I’ve also been influenced by the wonderful Laban Carrick Hill, another former faculty member at Solstice, who has taught me so much not only about writing, but about perseverance and heart. Your work has influenced me, Meg, because of its incredible boldness and fierceness. You’re such a straight shooter, so unafraid, so honest even in your fiction. That fierceness inspires me. Then there are more traditional influences: the Russian classics, which have always spoken to me, and writers ranging from Jane Austen and Emily Bronte to poets such as T.S. Eliot and Emily Dickinson. Lately I’ve been reading or re-reading a lot of work by a friend of mine, poet Alison Stone, whose work also inspires me. And every now and then I read a contemporary book that is a game changer for me in terms of the way I think about writing and life. The Elegance of the Hedgehog by Muriel Barbery is an example. Do you have a favorite quote that moves you?